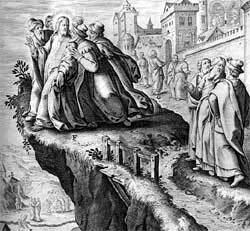 The angry mob tries to push Jesus over a cliff. A SAD DAYhad come for Nazareth, the city where Jesus had lived since his babyhood years. And this sad day had come on the Sabbath. The Jews from different parts of the city were gathering in their house of worship, the synagog. Among their number was Jesus; for he had returned from his visit in Cana. Always while he lived in Nazareth he went every Sabbath-day to the services at the Synagog, where he heard God’s words read from the books of the law and of the prophets. Now, Jesus was no longer just an ordinary person among the other Jews of Nazareth, for they had heard about his teachings in other cities and they wished to hear for themselves what this son of the carpenter Joseph would say. So when the time came for the services to begin, Jesus stood up to read to the people, and the minister of the synagog brought to him the book that the prophet Isaiah had written long years before. After reading these words, Jesus closed the book, gave it back to the minister, and sat down. Then every one in the synagog looked at him, expecting to hear him speak; for the speaker in the synagog always stood up to read God’s words and sat down to explain the meaning of what he had read. Among those who listened to Jesus that day were his neighbors who had known him nearly all his lifetime. Proud men they were, unwilling that the carpenter’s son should teach them new truths. They had heard of the miracles that Jesus performed in Cana and in Capernaum, the city by the seashore. But they did not believe that Jesus was the promised King of the Jews. They knew he was only a poor man, and they did not respect him for being great and good. But those proud men were surprised when they heard Jesus’ words. They did not know he could speak so well; they did not know that he was the greatest teacher who had ever spoken to men. For a while they listened very carefully; then Jesus told them that Isaiah’s words were fulfilled by his coming to preach the gospel to the poor and to do other wonderful things that Isaiah had promised. Jesus knew they would not receive his words and believe them. He told them that no prophet was honored by his own people. And he reminded them of the time when Elijah, the prophet, ran away from Israel to hide in the home of a poor widow who lived in a heathen land. Because this poor widow cared for God’s prophet, God took care of her. He also told them about the heathen leper, Naaman, who was healed by God’s power when he obeyed Elisha’s words, although many Israelites had leprosy and were never healed. The proud men of Nazareth quickly objected to these words of Jesus, although they were true happenings among the Jews long before. They believed that Jesus was trying to show them how God cared for other people besides the Jews, and they did not like to hear such words. So they refused to listen longer to his teachings, and the service at the synagog broke up in great disorder. The leading men ran to Jesus and took hold of him roughly and drew him outside their synagog. Then a mob of angry people followed, wishing to see Jesus punished because he had spoken the truth to them. This mob led Jesus to the top of the high hill upon which Nazareth was built, intending to throw him down upon the sharp rocks in the canon below. But the time had not yet come when Jesus should die for the sins of the people, and therefore they could not carry out their wicked intention. He simply walked quietly through the midst of the excited throng. No one seized hold of him again, and he left them and went away to live in Capernaum, the city by the Sea of Galilee. The men of Nazareth did not know what a terrible deed they had tried to do that day; they did not know that their foolish pride had caused them to drive right out of their midst the gift which God had sent from heaven to earth. And because they refused to believe in Jesus as the one of whom Isaiah had written, they never received the gift of salvation, which Jesus brought to men.